The Island of Fortune, Nasugbu, Batangas. Image source: United States National Archives. Colorized courtesy of Algorithmia. 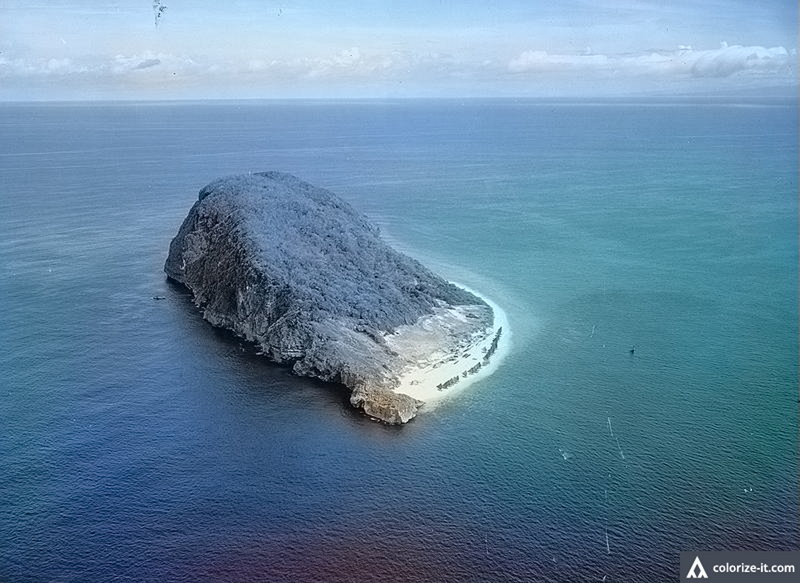 Fortune Island is a rocky island just off the coast of the western Batangas town of Nasugbu. In the year 1926, the American colonial government through a proclamation1 issued by then-Governor General Leonard Wood reserved land within the island for lighthouse use to help seafaring vessels traversing offshore along the South China Sea. The contents of the proclamation, numbered 5 from the series of 1926, are presented below, along with scans of the historic document below the text. Beginning at a point marked 1 on Bureau of Lands plan Ir-221, N. 53° 01' W. 252.33 m. to point 2; N. 43° 50' W. 132.97 m. to point 4; N. 27° 39' W. 98.86 m. to point 5; N. 23° 49' W. 309.59 m. to point 6; N. 40° 17' W. 138.58 m. to point 7; N. 69° 08' W. 112.36 m. to point 8; N. 11° 15' E. 69.13 m. to point 9; N. 47° 07' E. 116.29 m. to point 10; S. 56° 11' E. 164.44 m. to point 11; S. 52° 38' E. 78.29 m. to point 12; S. 38° 00' E. 62.13 m. to point 13; S. 35° 45' E. 332.01 m. to point 14; S. 58° 35' E. 141.46 m. to point 15; S. 38° 19' E. 168.15 m. to point 16; S. 18° 51' E. 75.70 m. to point 17; S. 6° 47' E. 256.72 m. to point 18; S. 17° 23' W. 45.85 m. to point 19; N. 46° 53' W. 44.54 m. to point 1, point of beginning. All points are on shore or sea; point 1, G. I. S. on stone on top of hill. Bounded on the north, by sea; on the east, by sea; on the south, by sea; and on the west, by sea. Bearing true. 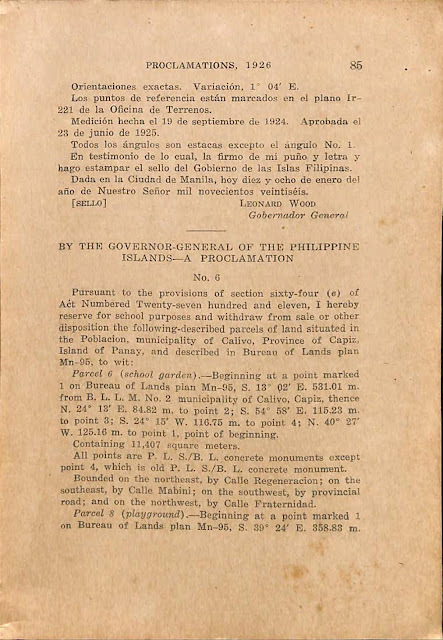 Declination, 1° 04' E.
Points referred to marked on Bureau of Lands plan Ir—221. Surveyed, September 19, 1924. Approved, June 23, 1925. NOTE. — All corners are stakes except corner No. 1. N In witness whereof, I have hereunto set my hand and caused the seal of the Government of the Philippine Islands to be affixed. Done at the City of Manila, this eighteenth day of January, in the year of our Lord nineteen hundred and twenty-six. Proclamation No. 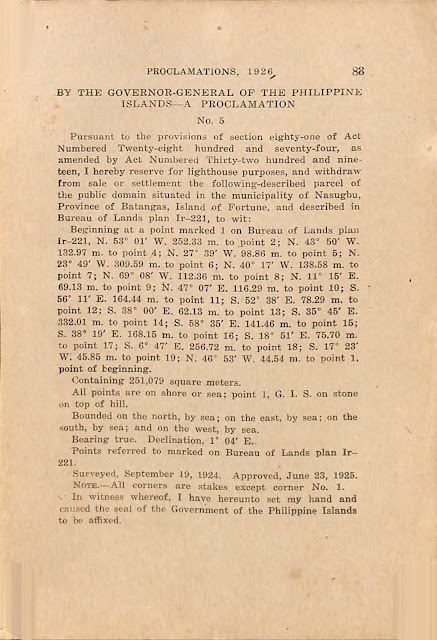 5 series of 1926 reserving Fortune Island for lighthouse use, English version. Proclamation No. 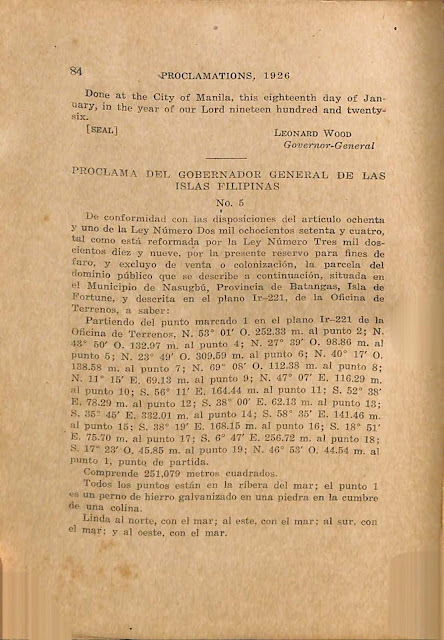 5 series of 1926 reserving Fortune Island for lighthouse use, Spanish version. Proclamation No. 5 series of 1926 reserving Fortune Island for lighthouse use, Spanish version, continued. 1 “Proclamation Nos. 1-61 (1926),” online at the Internet Archive.